I figured I might just as well detail my process of cleaning lineart, since people keep asking how I do it. As you know, I often sketch digitally, especially for more complicated scenes, and then print out my sketch in a very light, very saturated colour onto Bristol board. Then I use those messy coloured lines as guidelines and draw my clean lineart in pencil (H mechanical pencil, 0.5 size) on top of them, sometimes deviating more, sometimes less. Here, I changed the entire pose to something less stiff. The lineart is then scanned (in three parts, as I was working in A3), reassembled, and looks like this. The rest of the cleanup job will be conducted by my trusty old friend, Photoshop 6.0. What were you saying? Outdated how? Speak up, sonny! To get rid of the orange lines, I then open the colour adjustment window using Ctrl+U. I select “red” and then “yellow” in the top rolldown menu, and slide the bar that adjusts the brightness all the way to the right for both. See – all the orange is gone. I’ve tried using other colours for the underlaying sketch – cyan for a time, or yellow, but usually, you have two tones you need to filter out. But that’s just a mouseclick. I like orange because it’s great to filter out (better than magenta/pink which usually leaves a greyish rest), and great to work with while I’m drawing on it. Yellow is also great to filter out, but hard to see while doing the lineart! Then I adjust the contrast using Ctrl+L, and use the burn tool to get rid of smudgy areas I want white in the final lineart. Sometimes, I also tweak the lines to correct mistakes or just try around in areas that don’t fully satisfy me. 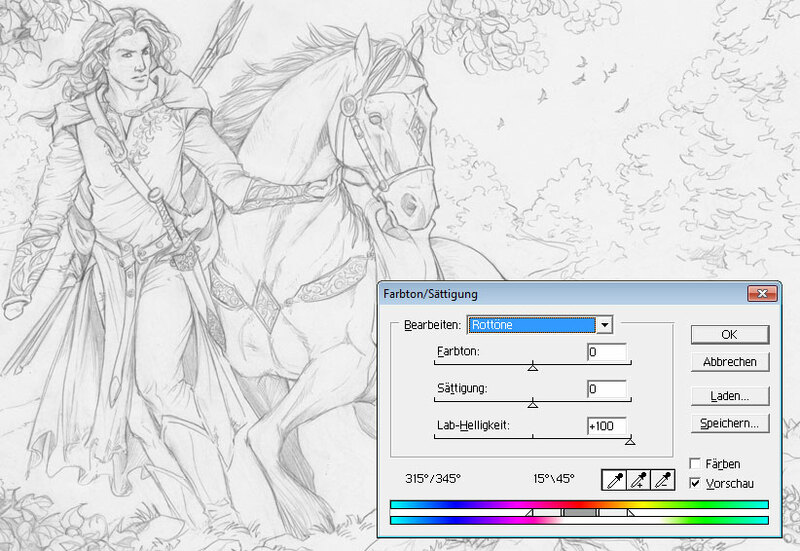 Here, I changed Maedhros’ face a bit. Lastly, I tint the lineart (again using the Ctrl-u function), usually to something in the red to blue range. When I print it out later to be watercoloured, I leave the tint in place, as a slightly coloured lineart results in a more dynamic colouring. Printing my lineart on watercolour paper is something I’ve done for a long time now. It can be a failsafe against botched watercolour attempts or dirty-water accidents (though that probably doesn’t happen more than once a year). Mainly, I do it as it allows me to develop a very detailed lineart on smooth drawing paper, something that watercolour paper just doesn’t allow to this degree. A bit OT thoughts. I always wonder one thing – why do you expose his stump? This si something I would keep out of sight, cover with clothes or an artificial hand (which I believe Curufin made for him to make life easier). I don’t think Maedhros would show off his lack of hand. Not in a situation like this, when he is alone, but in general while being with other people. Though I have no idea what is easier, less difficult for a person with amputated hand – to have it exposed or covered. I mean – is the tip pain sensitive, irritated by touch, dirt, sunlight etc. I would imagine it is, thus would rather cover it in silk than let it get in touch with sand etc. Just after his rescue, I usually draw him with his arm in a sling because I suppose it would still have been painful for a time. Afterwards, I wondered what would be worse for him. People *would* stare. A maimed Elf isn’t something you see every day. Would they keep trying to catch a glimpse of it hidden in a long sleeve? Best to shove it in their faces (figuratively speaking…) see their shock, feel a brief moment of satisfaction, and be done with it. Maedhros has always struck me as a blunt, honest type. Possibly with a rather blunt, grim sense of humour after Thangorodrim. I don’t think it’s unlikely that he would have seen the stump as a rather twisted badge of honour. And there’s another reason not to hide his stump. The war against Morgoth became his passion, his obsession. What better unspoken reminder to those around him, most of whom never suffered under Morgoth the way he did, of the danger of their enemy? I remember that the Middle-earth Role-Playing supplement gave him an artificial hand. I never liked the thought. Prostheses don’t fit my world view of Middle-earth – stiff ones certainly wouldn’t work for an elf, and anything “enchanted” or even “mechanical” sounds plain creepy to me, and not in-genre. Just my ideas, idiosyncratic and non-conclusive. ;) And of course without any real textual evidence. I can see as this could be a badge of honor and a reminder to what he’s been through. Using it ijn a blunt way directly to the eyes of others, too, if necessary. Still in most cases I would rather go Jamie Lannister style and gave him artificial hand in such situations; then some soft material cover for comfort while being in private. Maybe it’s just me, but I feel touching outside world with this stump would be irritating for skin. Though maybe in real such parts are dumb to touch? No idea. Also for him remembering his mother name and comparing to what he sees could be hurtful. Nup, with that neck it’s not a cob, and with those feathers, it’s not a thoroughbred! A very handsome horse, although if you’re having fun with horse proportions.. I don’t know if you know Sam Savitt’s book ‘Draw Horses’; good for different breeds and their proportions from multiple angles + gaits. It’s on Amazon, (and there might be a pdf floating around the interweb). Would he wear the sword on the left hip? I love the frame of foliage – looking forward to seeing the final version. The sword is the Noldorin equivalent of a hunting knife so he’d wear it on his left hip. 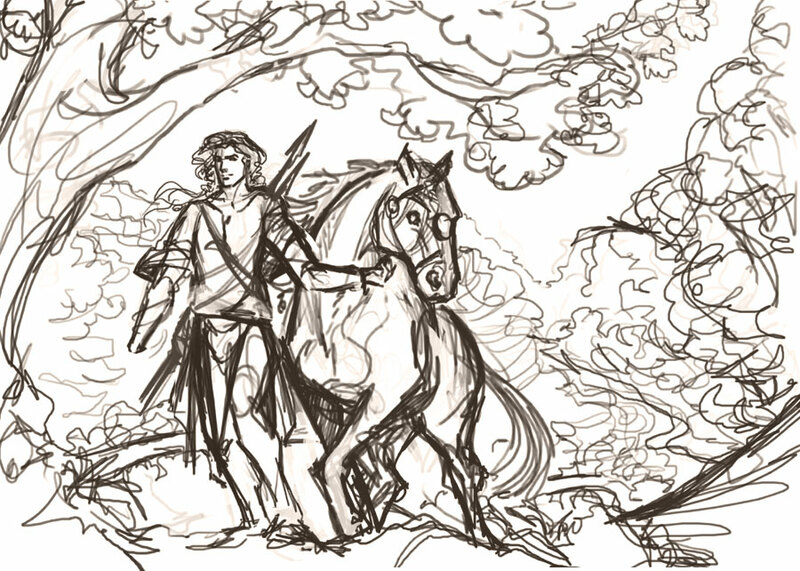 :) I doubt even Maedhros would bring a sword along on a hunting trip. Ahh, I can’t see the full length, and wasn’t sure if it was a knife or a sword. If you want my 2c on the horse: very handsome head, good neck and chest. It’s the legs that let you down. The front ones are okay, but the hind legs (particularly the left) are a little on the ummm…stumpy? side. If the horse is coming up a hill, there should be a little more extension and definition of the hindquarters. Horses are to a certain extent rear-wheel drive, and you really feel their strength when they’re climbing hills, particularly at speed. I realise they’re walking in your pic though. I think if when you colour it you define the line between the hip and the knee, so it doesn’t look as though the knee joins the belly you’d be right. 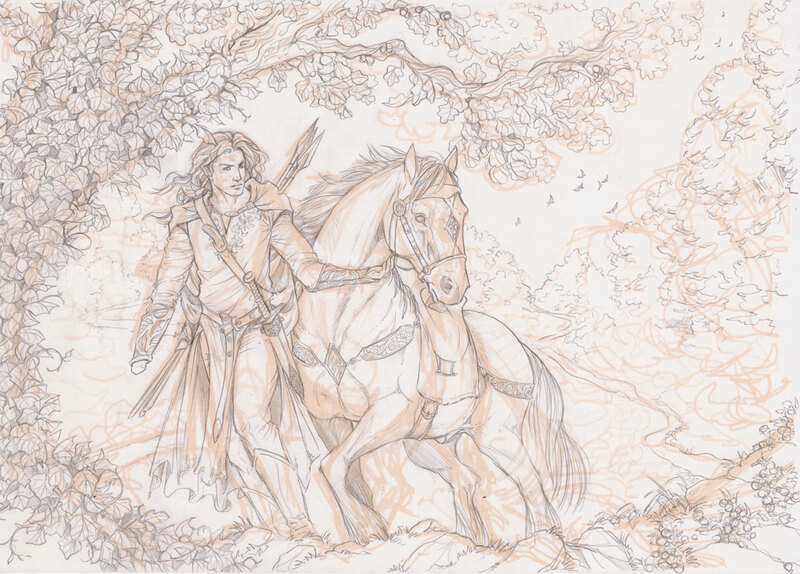 Of course, that’s only if you want the horse moving: it may be that Maedhros is dragging him away from a particularly luscious patch of vegetation and so he’s digging in. Static, the definition of the limbs is more easily lost. I usually draw him with his hair loosely tied back (not braided… he can’t do that on his own and his pride would forbid him to let others do it), but I imagine the wind just tugged those strands out. :D Ja, das muss man wohl können… aber ich denke das sind nur die Mindesanforderungen… also das mit den Orks und Hirschen. *lachab* Vor 20 Jahren, in meiner wilden Jugend, hab ich mal ein paar Stunden lang alles mit rechts gemacht, um zu sehen, wie das so ist. Ich finde es grade beängstigend und beruhigend zugleich, dass ich damit nicht allein bin. Und cool, dass du auf solche Dinge achtest. Auf Curufins Sattel hatte ich noch nie geachtet. Interessant, dass die Noldor offenbar “zivilisierter” sind als ihre wilderen Verwandten. Kein Ding, ich hab viel zu wenige Menschen in meinem Leben, mit denen ich über solch wichtige Dinge faseln kann! Tolkien selbst hat diese Frage in einem seiner Briefe mal beantwortet, weil die Unterschiede zwischen Glorfindels und Legolas’ Reitstilen auch Lesern aufgefallen waren, und er sagte, brauchen täte es auch Glorfindel nicht, aber es diene wirklich der Zierde. Wobei ich mir auch gut vorstellen kann, dass die Passagen in der Lay of Leithian, dass Curufin mit Sattel reitet, längst geschrieben waren, als Tolkien den Herrn der Ringe schrieb, und dann nicht mehr überarbeitet hat. Dann bin ich erleichtert, dass ich nicht damit genervt habe. He’s really handsome, I like this. And happy, that is also priceless. But I really feel envious: you already have spring so it is possible to draw outside… Here, There is still winter. It *is* highly unusual for Germany to be this warm in March. It’s surreal though – the nights are so cold that the car windows freeze, you drive to school in your winter coat and wish for gloves – and by break time, the students beg me to do the next lesson outside! Do you print on a special paper with special printing ink, because in my experience prints bleed like hell when something wet gets to them. The fact that you start digitally, then print to draw traditionally, is an interesting way to tackle the sketch->finished lineart process and not something I ever thought of trying. What three parts is the line art scanned in: background, foreground, figures? Or just three sections because it’s too big for the scanner bed? The latter. :) I drew this in A3 size, and scanned the left half, and the right half, and the middle, or I always end up with a blurry strip somewhere in the pic. Sounds like you have something specific in store for him… The-you-know-what? I mean the th-word? So, as a horse person, can you tell me if the horse works? It didn’t until the very last revision. As for the details: perhaps a larger muzzle to match that wide forehead? And I’d also give him bigger eyes (but I may be biased, as I’m into Arabians and they have eyes like saucers, lol). 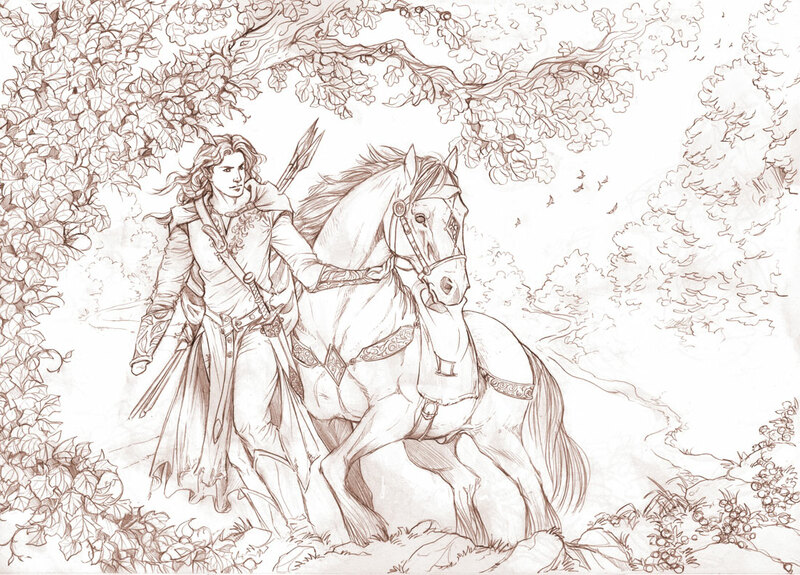 I think the horse would probably turn his right ear towards Maedhros to show he’s paying attention to his Elf (Mona is doing something like that in pictures 7 and 9 on my flickr). 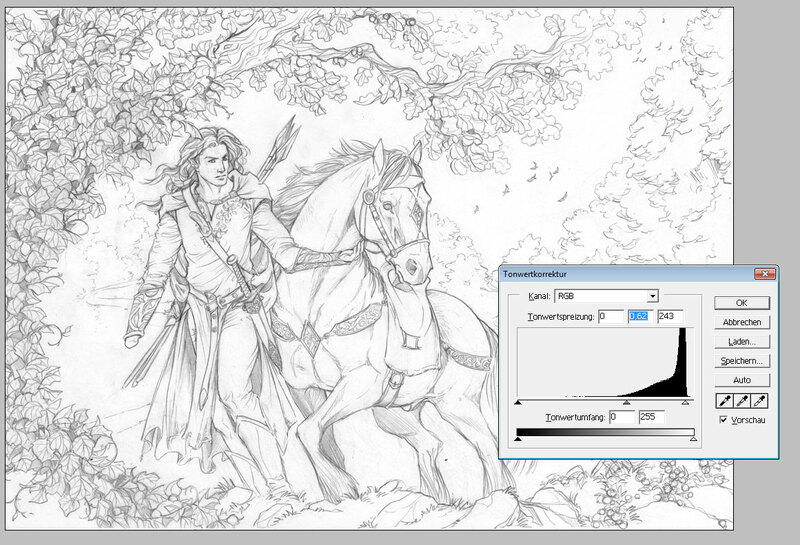 I’m also worried about one thing: isn’t Maedhros too much in front of the horse? I mean, when they both step up, isn’t the horse’s right front foot going to land on his left heel? Just some rambling and nit-picking: feel free to ignore it. I did incorporate your ideas for the muzzle and ear. Nice one! Thank you! Hi! I1ve been following at DeviantaArt for a while, but just recently discovered this blog. Your work is amazing!!!! But reading this tutorial I cant help wondering how do you watercolour a piece printed with an inkjet printer (i guess it’s an inkjet) without smuging the lines with water?